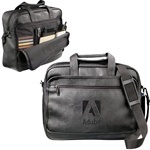 Here at LogoToYou.com, we are proud to provide an extensive collection of personalized computer cases for the professional who is always on the go. These cases make personalized single gifts with a custom print design or are perfect to hand out as employee gifts or to clients at tradeshows and expos. Custom Durahyde Imprinted Computer Attaché Case is made from DuraHyde. Custom Swerve High Sierra Computer Backpack is made from 600-denier PolyCanvas. 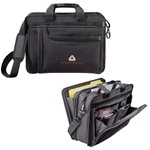 Promotional Excel Printed Sport Briefcase is made from 600-denier PolyCanvas. Promotional Vertical Verona Computer Briefcase is made from 600-denier PolyCanvas. Personalized Deluxe DuraHyde Briefcase is made from DuraHyde. Custom Expandable Northwest Saddle Bag is made from 600-denier PolyCanvas. 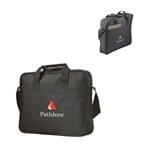 Custom laptop bags are a great way to advertise your organization with a popular item that nearly anyone will find valuable. Given the growth of technology, nearly everyone utilizes a computer for academic, business, or personal purposes. During a busy day, people may have to transport this type of item and are obviously concerned with keeping it safe. Here at Logo To You, we offer a wide array of stylish and durable choices that can be personalized with your organization’s logo. Marketing campaigns and advertising plans are usually based on targeting a certain demographic. Though these concentrated efforts are made with the intention of improving efficiency, limitations are nonetheless present. Customized laptop bags are a product that can prove valuable for individuals of all ages in all walks of life. Students, office workers, and travel enthusiasts can all benefit from this type of item. The presence of your unique logo provides a way for you to achieve constant advertising and show off your brand to new people consistently. A stylish logo isn’t the only quality our custom laptop bags come with. Each model is made from sturdy material to ensure that they will last for the long-term. From DuraHyde to Dobby Nylon, to Denier Nylon, each type of material is sturdy and fitting to provide proper protection for your clients’ belongings. In addition to the classic style of computer carrying case, we also offer a number of other variations. From backpacks to wheeled models, you are sure to find something that meets your need in our impressive selection. Each model has a number of pockets and compartments to help store pens, phones, keys, and more. Sending the right message about your organization is very important. We understand you are very particular when it comes to the type of logo and design you want on your customized laptop bags. We will provide email confirmations of the designs before beginning any job to ensure that our design accurately reflects the expectations you have for your unique logo. 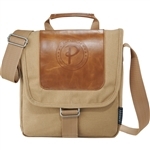 Useful and modern looking, we offer a variety of computer case options from zippered backpacks and organizers to custom leather laptop bags. Each case can be personalized with your company’s logo or branding and we guarantee we will not start production until you are 100% happy and approve all the art work. Its never been easier to order computer cases! We strive to make every purchase a pleasure. As a part of that process we will not begin production until you 100% approve all artwork. After you checkout or even now you can email( art@logotoyou.com) us your logo or text layout.